The world is flooded and some people have survived and managed to build small towns and even massive cities on the ocean that now covers the world. Is this possible hypothetically? How much of the world's population would be left after such an event? How much is it flooded? A Noah-style flood went over the highest mountains. Ignoring the scientific plausibility (which is easy-enough to do when you have either religion or a science fiction/fantasy author involved), this is a LOT of water. A flood of a couple hundred feet is enough to do a lot of damage, but is not nearly as bad (as explained below) as a Noah-style flood. This is essentially a Noah-style flood, whether the tops of a few mountains are accessible (which is better than nothing) or not. According to the Wikipedia list of the highest mountains on Earth, there are 108 > 23,000 feet. That is more than "a few" but is good enough to work with. 23,000 feet/5 years ~ 12 feet per day of rise in sea level. That is a LOT. Assuming we have little additional warning, that means coastal cities have problems within a few days. So let's assume, for the moment, that there is a little bit of warning, just to give some people time to stockpile supplies and quickly put together a few ships. But not decades like my original answer. Underwater cities won't work without a huge amount of time to prepare. Water pressure increases by 1 atmosphere every 34 feet. It is possible to live at the natural pressure a few hundred feet below the surface, with enough preparation - and being extremely careful (and slow moving) coming back up. But with only the tops of the highest mountains above water, there will be relatively little land near the surface to build on. That means taking existing cities and enclosing them to be livable at a normal pressure. That is not too hard for 2 or 3 atmospheres. The highest cities are currently ~ 16,000 feet above sea level. 23,000 - 16,000 = 7,000 feet. 7,000/34 = 205 atmospheres. Not going to happen. So that limits any practical survival to the surface of the ocean. If you start with an US aircraft carrier (which has been used in many science fiction novels that I have read) then you have a nice big platform for building on and a nuclear power plant to supply power for a while. If you start with a cruise ship then you have living quarters for thousands of people with all the amenities. Take either (or both) of these and link up plenty of smaller ships, boats, rafts, etc. and you can safely house thousands of people. Add a hospital ship and you have medical taken care of, at least for a little while. Container ships can be a huge help. They aren't great for living quarters, but a ship with thousands of 40-foot containers can hold enough supplies - food, medicine, clothing, etc. - to help people survive for a while. But they won't last forever. Fuel is a BIG problem. If you have a global flood, you can't drill for oil, dig for coal - and even if you can, a refinery takes above-water facilities that you simply don't have. Solar energy isn't nearly enough because you don't have large areas for solar panels or other collectors - in fact, you are likely building up, not out, in general - look at a typical cruise ship for an example. Nuclear power from your aircraft carriers will help for few years, but it is limited in both time & capacity. If there is enough planning from the nuclear-capable countries - e.g., US, Russia, France, Japan - then you can build a bunch of naval reactors (i.e., like the US aircraft carriers & submarines use) and mine/process as much uranium as possible to, hopefully, provide power for a group of large ships for several decades. If not, then Fuel will be a big problem. 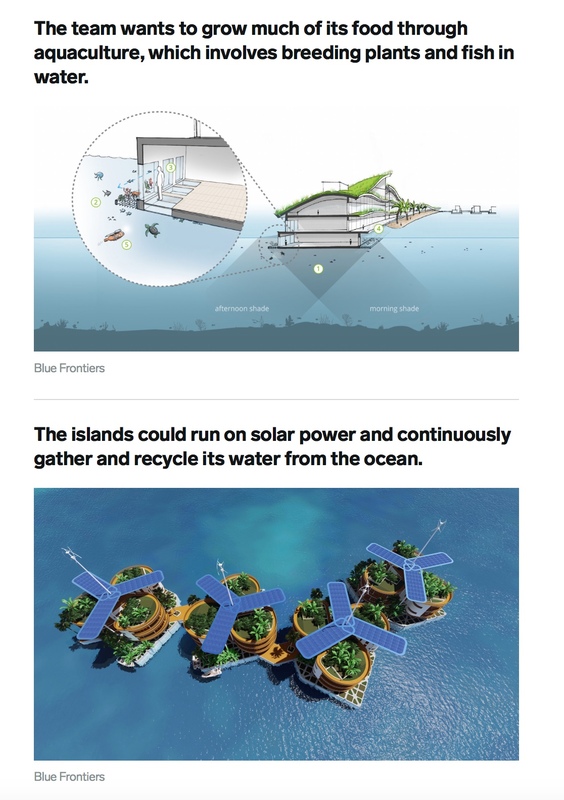 While it may be possible to extract uranium or thorium from seawater and use that to power your floating cities, setting up a floating system to do all of that will take time to develop & test that you just don't have. I hope everyone likes fish & seaweed. Every little boat becomes a fishing boat. Every day they spread out to the surrounding area and throw out their nets and collect what they can. At the end of the day they head back to the mother ship and have fresh fish for dinner. Everything else can be stockpiled but really won't last long. A fish/seaweed diet is likely to be low in a number of vital vitamins and minerals - think Vitamin C/scurvy - so a stockpile of key vitamins and other nutrients will be critical. Greenhouses, green roofs, etc. can help some by providing a place to grow fruits & vegetables, but only the top level of your ships will work for that, and doing so is not compatible with covering the top of everything with solar cells to produce electricity - some tough tradeoffs will be needed. Pirates will be everywhere. Only the largest countries or the largest private organizations will have self-sufficient (though all time-limited) "cities". Plenty of people will grab their guns and their boats and when they get hungry...watch out. A destroyer equipped for battle can easily stop enemy boats. An aircraft carrier or cruise ship teeming with refugees has a harder time, plus the big guns will run out of ammunition before the pirates do. No home base to call for support. Problem # 4: Everything Else! Supplies of everything will be limited. No factories producing clothing and electronics in China. No factories producing medicine in the US. Unlike many other global disaster scenarios, no scavenging of supplies from abandoned cities. Largest "cities", on the order of 10,000 - 20,000 people - decimated within 10 years due to lack of fuel, food and supplies. Smaller "towns", on the order of 100 - 1,000 people - most will not last long at all, but some (private "towns" funded by billionaires) will be well planned, well stocked and last for decades if disease doesn't kill them off. You have to become a "space faring" civilization. I don't mean that you have to build spaceships and escape the planet. Instead, you have to be able to develop the same technologies required to establish long-term colonies on the moon, mars or to build interstellar generational ships. (That's why I placed "space faring" in quotes). Basically, all the problems mentioned in manassehkatz's response can only be solved if your civilization has already mastered (or has come close to mastering) the technological hurdles required to survive in harsh, enclosed, and limited-resource environments. This translates to developing efficient means of food production (e.g. hydroponics) and waste recycling. Reliance on 3D printing for nearly all manufacturing, and energy would have to be harvested from renewable means in the long run (solar, wind, tidal forces). This, in turn, would help stabilize your society and minimize the need for criminal enterprises such as piracy. Acquiring raw materials would be harder, so either proper preparations were made before the cataclysm and/or means were devised to "mine" materials from flooded cities (as in, demolish a skyscraper or large building and extract its steel and other rare materials). The last item to watch for is population control: limiting births to two per family would be sufficient to keep a population stable long term. Ironically, if such a civilization already has such technology available, they are most likely well underway in establishing off-world lunar, martian or martian-like outposts. These outposts would likely be placed in a situation where they'd have to try to find ways to help the planet's survivors. People have speculated on floating cities for a very long time. With clean energy tech it becomes more likely. This Blue Frontiers project is the most recent incarnation and apparently enough people believe it can happen that it is underway. 1: Food. This would be done thru aquaculture and some terrestrial plants (e.g. citrus, garlic) in greenhouses. Energy: Solar, wind, wave power (this would require a tether to the bottom as the city will move with the waves). Conductive metals will be in short supply but you can make conductive materials out of charcoal which can be made from bone or seaweed. Stuff that floats. This warrants some thinking. Nothing lasts long at sea. Plastic and metals will degrade. Wood will rot. There will need to be some way to make durable floats to keep the city up. Glass might be a possibility - one would need to dredge or dive for sand but one can make glass floats with low tech and they are durable. I chose the one with the barnacle to show how long it has been in the water. I am not worried about raiders. There will not be many people. Small communities police themselves. Individuals on their own will be no match for the well fed citizens of the floating city. Within a few decades no-one will have any tech advantages. I am worried about inbreeding over the long term. Hopefully there are other similar settlements elsewhere and there can be some kind of exchange - useful for other reasons as well. First, we need to consider how the towns will be built. I'll try to give a detailed breakdown of each of these so you can see different ideas of how to work this story's angle. Overcrowding: If a city is built on a ship, you have a limited amount of space to work with. From my research, the largest cruise ship ever capped out at less than 4,400 passenger capacity. Nimitz-Class Aircraft Carriers hold 6,000 personnel. Let's say your ships were capable of, on average, holding an upwards of 5,000 passengers while still being reasonably functional for other needs. The fact there is a definitively finite amount of space means your cities will deal with overcrowding quickly. You can probably assume the ships could handle a cap of 10,000 people, but that'd likely mean that all the city was used for was holding people: minimal-to-no food, plants, animals, or supplies. These cities would be completely reliant on ships carrying valuable resources in order to survive once they've reached that 10K capacity. If we assume an annual population growth rate of 1% (which is lower than that of the world's annual growth rate now) and a starting passenger count of 1,000, the ships would reach overcrowding (10K+ passengers) within 232 years. If the starting passenger count is 2,000, overcrowding would occur in as little 162 years. If the starting passenger count is 5,000, it occurs in as little as 70 years. This essentially means, if you want a city to survive for a longer length of time, you'd need to start with a smaller population size. The smaller the initial population, though, the sooner people would be forced to in-breed for a continued population. The larger the initial population for the close, confined space, the faster disease will spread and the more people who will be killed by sickness. Additionally, the more people there are, the more resources will be needed and consumed. Sickness and Injury: As said earlier, the more people there are, the easier sickness can spread. If one person catches a contagious disease, then you can expect many people to get sick with it as well. Disease can cause multiple problems such as a drain on resources, a need for medicine, and potentially death. As for injuries, there'd need to be at least two competent doctor and 3 nurses or medics on every ship. If someone gets hurt, the nurses and medics should see the injured person first and try to resolve the issue themselves, freeing up the doctors for surgeries and more serious injuries. The nurses and medics should also constantly be trained by the doctors so that they can become doctors in case either of the first doctors die and they should be training the next generation to become medics to fill their spots as well. This allows for there to be a constant cycle of competent practitioners on-board the ship at any time to help keep people safe and alive. If the limited number of doctors die, though, then that means the city is as good as dead if the nurses/medics aren't trained enough to make up for the lack of doctors. Finally, venereal diseases would have to be heavily screened. In our world, venereal diseases are an inconvenience for most, but usually don't make for a problem for greater society, especially when most can be cured with medicine. If we assume these ships have a limited amount of space for supplies, it's not like they could afford to waste space on supplies for venereal diseases. If you have a venereal disease, you wouldn't be allowed to board the ships in the first place; the passengers can't afford to risk letting diseases like HIV/AIDS, gonorrhea, or syphilis spread. If these people do board ships, it'd likely be ships that are specifically designed exclusively for those who are infected with venereal diseases and those who want to go with them (such as family and loved ones). These ships would likely be split into two types: Curable and Incurable. The curable ships would have treatments available to cure the diseases ailing the passengers, allowing them to proceed to happy and healthy lives. The Incurable ships would be stocked with treatments to reduce the suffering of those infected, but would ultimately be an effort to protect everybody else. In-Breeding: This is trickier to avoid. The population size is limited by the ship size. The larger the ship, the more people and resources it can hold; however, the more resources the ship has, the fewer people it can hold. The lower the population, the greater likelihood in-breeding and the associated side effects will occur in time. According to this, any population lower than 10,000 poses a serious risk within the first 200 years, meaning a ship city will already be off to a bad start if they can't get new genetic diversity within each generation. A starting population of 2000 will result in these problems starting within 100 years. A starting population of 500 will result in in-breeding as an issue almost immediately (like 35 years or so). It's not that I am saying the consequences will be immediately apparent, but it will be a start to the process. I have a solution to this, but this problem is directly tied to the next point, so I'll put the solution there. Resources: Just as in-breeding is difficult to avoid, resource draining will be a hard problem to avoid. First, let's talk food. Fortunately, the world is all water. This means that there's going to be one ready source of food: fish. Anyone with allergies to seafood, however, will be in for a bad time, because fish would be a necessary staple to survive. While fruits and vegetables may be available, along with other sources of meat, they can't be relied on as a sole source of food for any member of a ship's population. If anything, they'd only be useful as a side dish or herbal medicine, maybe as a meal for the days when no fish are caught. To increase the amount of edible plant life available, a large garden can be put on the top decks of the ship or if appropriate synthetic sunlight lamps are available, can be placed in a lower deck of the ship. Additionally, underwater farming of seaweed and kelps can be used as a means to avoid needing to tap into the on-deck reserves. As for water, there's plenty available, but it's all undrinkable as is. The ship would need to have multiple pumps filtering seawater converting it into usable drinking, bathing, and other general uses. (Technically you can use it, but it's not safe to use it often.) Then we have fuel issues. Unless you intend on setting up oars, sails, and other means of propulsion, once the ship runs out of fuel, it will be stuck in place, helpless to the tides. Honestly, with the size and weight of these ships, anything less than an engine probably won't be enough to move the ships, meaning a cruise liner probably wouldn't be a possibility anyways. You can probably say the ship has some sort of super-advanced solar-powered, wind-powered, and/or will-powered fuel source so that this is less of an issue, but if you want realism, a ship that is actively sailing may be able to last up to two weeks at best, but you may be able to stretch that to a few months if the ship rarely sails anywhere. If you have the engines running on an alternative fuel source, the ship can sail as long as the engines are maintained, needing breaks to "refuel" at a reasonable schedule. Then, you have issues with crafting resources. Unlike on land, there's nowhere to mine ores, farm trees, or grow large amounts of farm animals like sheep for wool, cows for milk, and so on. You would need to have all your resources either on-board or on another ship you can regularly meet with to restock. If you don't have a way of restocking, you can expect the ramifications to hit sooner rather than later. You could possibly turn kelp into paper for writing, but that'd be difficult and wouldn't preserve well. You could always reforge broken tools, but that'd require a capable craftsman and access to appropriate heat sources and fuel. Even if you were able to come up with temporary substitutes and solutions, the internet would be gone, so you'd have to relay everything by writing and teaching. You can't rely on being able to always show exactly what to do for the steps because it'd be wasteful to do so if it isn't immediately necessary. Finally, you have medicines and hard to produce resources. If something can't be produced with whats on-hand, you have to hope you can get it in trade with other ships or that you can live without it. For example, if one ship has plenty of medicines, bacterial cultures, and plants, it'd be reasonable to assume they'd be fine in terms of medicine. A ship that has run out of all of that, may be consistent of people who only survive due to hardiness, but if someone gets sick, they're as good as dead. A ship that is full of metal, wires, and electronics may develop its own culture around that maintaining heavy similarity to our current world, but they may have reliance on their technology to keep themselves safe and lack the ability to do anything without their machines once that supply of resources runs out. A ship full of paper may develop an art and writing culture, while trying to use that as a means to trade for food and other resources they may have to do without. A ship full of fabrics may develop a fashion culture where they trade clothing to the other ships. The ships would have their own cultures that require constant trade or conquest in order to maintain. On to the solution to this and in-breeding! Each ship would have its own culture by nature of what is on-board. Trade between ships would become a frequent need in order to survive, and would likely take place on aircraft carriers that have been redesigned to be basic "resource hubs" or "marketplaces" where different cities could meet and propose large amounts of trade, with the Hubs taking a small cut for facilitating these trades. Once a year, a festival would occur where the cities in the area would meet, party, and trade aspects of their cultures while allowing people to move from one city to another if they so wish. Every 25 years, the 10% of each city that had been there the longest would be required to move to a different one of the cities that arrived for the Quarter-Centennial celebration in order to maintain a balanced variety of genetic diversity and to reduce the risk of in-breeding. Additionally, since the cities that will be near a given hub will be different as time goes on, a city that had recently lost a large number of citizens due to disease or disaster could get a large in-flux of new passengers to help run things. This also means any skills and trades a given passenger has will now be available to the new ship. If the doctors of a ship died, one of the doctors from another ship can move to that city to take over that practice and teach the next generation. If there are no mechanics, technicians, or artisans, new ones can come over and get to work. It'd be a superculture of cooperation to ensure the betterment of every member city's own culture. Even at a cynical level, every member of society can be given an associated value and when they apply to move cities or when their time is up and they have to move cities, they can be traded between cities based on their value in exchange for new citizens and for resources. This way, no city feels like they are being forced to lose something because they can always get something in exchange. For example, if it's time for the city's most skilled fisherman to leave, they can trade him for medicines or a person (or possibly people) with a skill the city desperately needs. You could even play with this idea by bringing up the ramifications of "what if the leaders lie about how long a person has lived in the city to maintain control and "ownership" of them. After all, this system in a way isn't that different from slavery, where it's the city that owns the people as opposed to an individual master. You can also play with different political systems for the different cities as a result. The biggest issue these kinds of ship cities would have is 1) fuel running out making them dead in the water, 2) a limited amount of resources before running out, and 3) not being able to do anything if they end up in an area with no other ships. These cities would be heavily dependent on one another, but would also have to be able to act on their own to find new areas and access more resources. While it's not impossible for every ship-city to exist in one small area, it's also not a good idea for them to be that close in case the navigators mess up and crash into another ship. Also, if a storm does hit, they'd all be sunk... either figuratively or literally. Finally, there'd be limits to how much plant life can be grown and how many animals can be kept on-board for ranching purposes. Fortunately, a city built on a raft has access to a more traditional town-layout. The thing is, it would have many of the same limits and problems as a Ship-City. Overcrowding, In-Breeding, and Resource depletion would all be the exact same points. Fortunately, fuel would be a non-issue, so that's one resource not to worry about. If built large enough, these raft cities could even be built with large farms and ranches so that those resources will never run out. Any material resources like wood, stone, metal, and so forth would still be subject to depletion. If anything ever happens to the water purification system, the town/city would be even more doomed than with a ship city. Finally, if a storm were to hit, the devastation would be even worse as a ship city can have everyone get inside and at least better prepare for it. With a raft city, the plants and animals would most certainly be killed, the city would likely break apart, and the housing would likely be destroyed... all with no way to rebuild. Resource exchange between cities would need to send boats between locations, and people would need to be able to freely move between cities to ensure genetic diversity. Picture a large glass bubble. Inside the bubble, the bottom 15-20% of it is full of dirt. On the dirt there are trees, animals, houses, and people. The outside of the sphere has various machines on all sides, bobbing in and out of the water as the outer layer turns, the entire facility a giant gyroscope. Water gets pumped in by pumps for keeping the soil hydrated and for providing water to the residents. Periodically, the machines on the side activate to keep the environment still long enough for the top to open and let fresh air in. Occasionally, people get into those machines and sail off to get resources from other bubbles. In a way, this is basically an "underwater dome" meets "floating city" idea. If you weren't insistent on the city floating, I'd have just suggested an underwater dome ideas with ventilation shafts leading to the surface, but this was the closest I could modify the idea into. It'd have many of the same benefits and detriments of the ship and the raft ideas, but would come with the added bonus of being more resistant to the effects of waves and storms (in theory) as the gyroscope would keep everything upright, with the bouncing of it in the water being the biggest hazard as it would likely bob until the external stabilizers kicked in. Honestly, these are all thoughts of how the cities could exist. Frankly, all three of them would need to be used in conjunction so that there'd be more potential for survival. Would it last long? Not at all. The cultures would die off within a few hundred years at most due to war, disease, excessive in-breeding, and various other issues. Essentially, humanity would need to grow gills in order to survive indefinitely, but we'd (in turn) lose most, if not all, of what made us so great as a species. Sorry for the overly long answer, but this was a fun thought experiment and I wanted to see what I could do with it. I hope this gives you some ideas for your world. The world is already mostly flooded by the ocean, and people have reclaimed land from the ocean and built cities here. (For instance, look at The Netherlands). This is how the dutch got about half their country, so unless the ocean is prohibitively deep everywhere, it is definitely possible to do this on a scale that supports massive cities. Not the answer you're looking for? Browse other questions tagged cities natural-disasters or ask your own question. Would it be possible for a city floating on water to exist? How would cities be built on large ruins? How would a city of AI be built? How would a city styled like Venice be built with lava instead of water?